The Spurs got wrecked tonight, as most everyone expected they would. 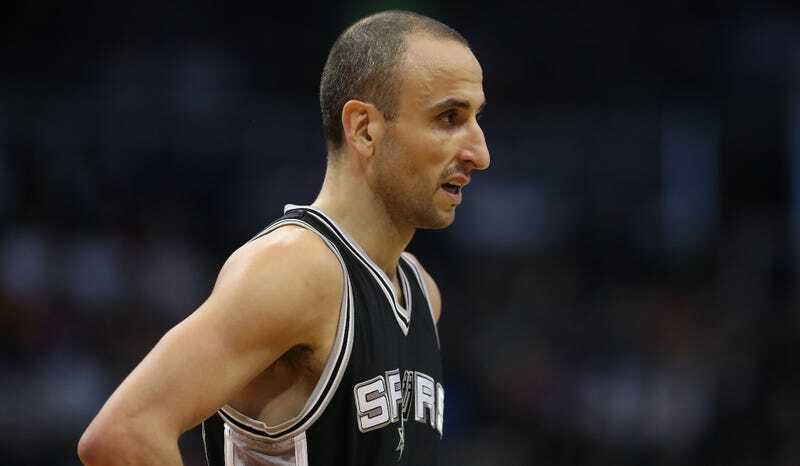 Golden State is headed to the Finals, and Manu Ginobili looks like he is probably going to hang ‘em up. While the Argentinian legend has yet to make a formal announcement about his plans, he has hinted that he would probably retire after this season ended. Ginobili will turn 40 this summer, and while he had one incredible game-saving performance in the playoffs, he played fewer minutes and did less with them than he has at any point in his career. This would be a fine time to leave, with the Hall of Fame a virtual certainty. Gregg Popovich got the celebration started early tonight, handing Ginobili the surprise start. It was his first start of the year and the first playoff game he’s started since 2013. Ginobili scored 15 points in a team-high 32 minutes before Popovich pulled him so he could get a standing ovation from the home crowd. Ginobili won four titles with the Spurs, and never ceased to be one of the NBA’s most creative players even after he slowed down significantly. There have been few players who play with the panache that Ginobili does and for long stretches when the Spurs played ground-bound, Paleolithic basketball, he was the only spark of joy on those teams. His exploits for Argentina have been perhaps just as impressive. He helped win a gold medal at the 2004 Olympics, beating Team USA in the process with a brilliant 29-point game in the semifinals. He led Argentina to a bronze medal in Beijing and earned a silver at the 2002 world championships, but his performance in Athens was an all-timer. At the end, Ginobili didn’t play as much but he still showed off that old pop from time to time. In a critical Game 5 victory over the Rockets, he poured in bucket after bucket and even blocked James Harden at the death to seal it. He could play again and serve as a mentor while occasionally showing out and taking over a game for minutes at a time. But if this is the end for Ginobili, he can leave the NBA with his head held high.